It’s been a long time now since my last post. My apologies to those of you who have been stopping by over the past few months hoping for updates! 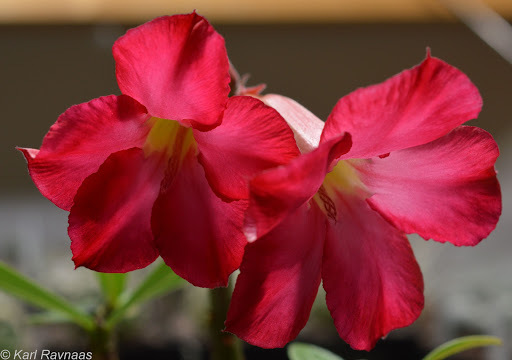 I will try to publish more often in the future, and start with a pictorial update of some more flowering over the past few months. All the plants shown below are between 16-20 months old at the time the pictures were taken. 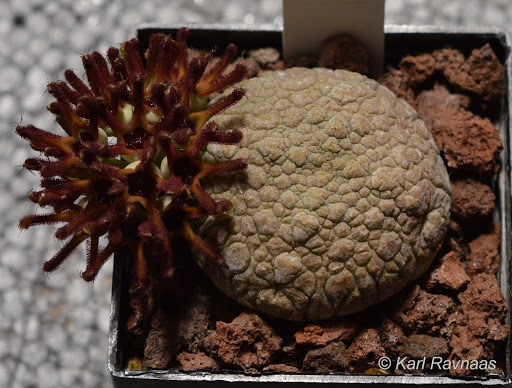 First off, my Pseudolithos cubiformis and P. mccoyi have simply not stopped flowering over the past year. Whenever one plant has begun flowering another has set buds, and so on. Thankfully the smell (or stench) of rotten meat from the flowers isn’t very noticeable unless you get your nose up close to them. I still haven’t been able to pollinate any of the flowers, but with summer now arrived I hope that some flies might come along and help out. 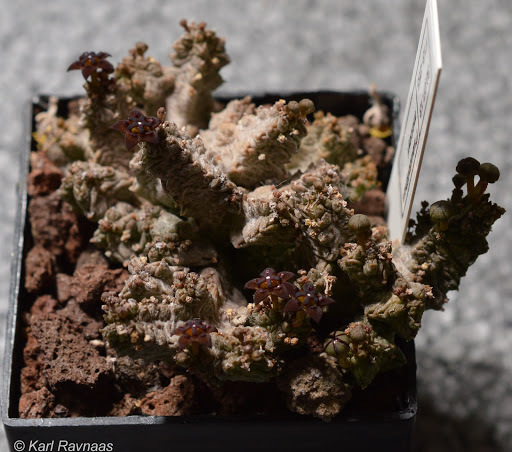 Pseudolithos cubiformis with a bunch of buds ready to open. P. cubiformis with the flowers just starting to open. P. cubiformis with all the flowers open. They stay open for about two days. 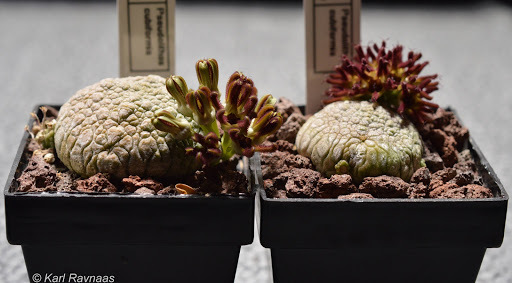 Two P. cubiformis in flower. Unfortunately I don’t know how to pollinate them without the help of flies. 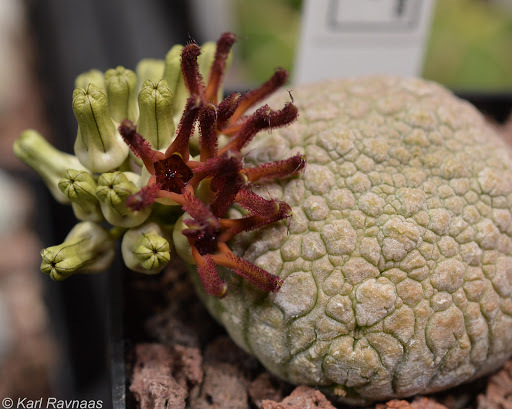 Pseudolithos mccoyi in flower. The flowers are quite a lot smaller than P. cubiformis and the structure looks very different (at least superficially). The flowers of this species don’t really smell much. Close-up of a flower of P. mccoyi. 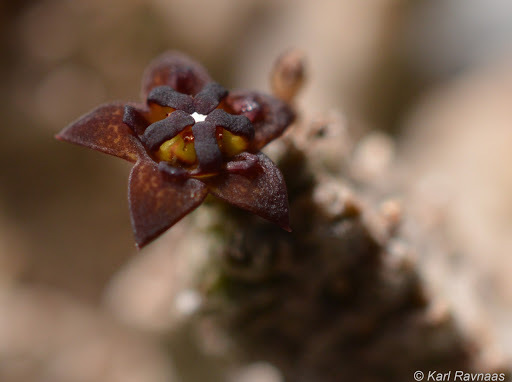 The flower is approximately 5 mm wide. 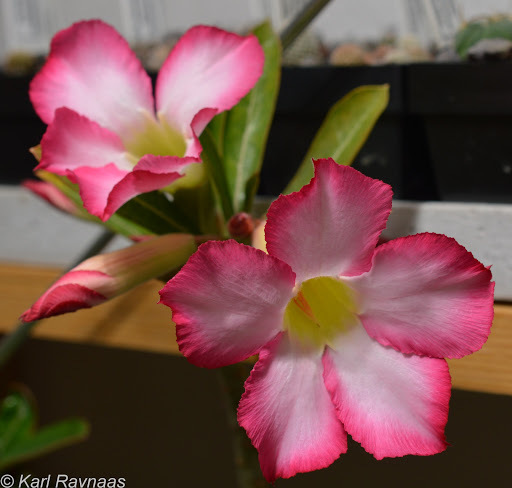 I’ve also had a bit more flowering from my Adenium, with A. multiflorum continuing to flower, but now also joined by one A. obesum. At this age all of A. multiflorum, A. obesum and A. arabicum look rather similar superficially, with only some small differences in leaf shape. The flower colour between A. multiflorum and A. obesum was very different, though I’m not sure how variable the flower colour is or whether it stays true to the species. I am not even sure whether the above three are really separate species or just forms of one variable species. Adenium multiflorum with pretty pink and white flowers. A. multiflorum flower at very close range. 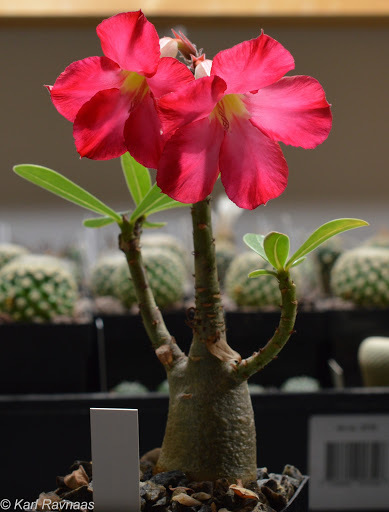 Adenium obesum with flowers that look more or less identical in structure to A. multiflorum, only with a different flower colour. The deep pinkish-red colour is very attractive, though. A zoomed out picture of the A. obesum pictured above. 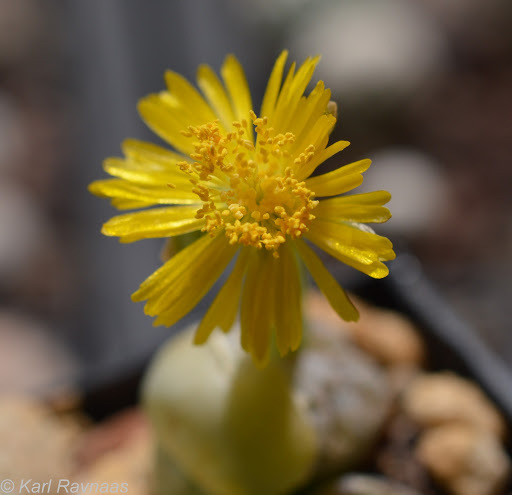 A few months ago Lithops werneri produced a flower, so far being the only species of Lithops that have decided to start doing so. Two plants of this species have flowered now, and both kept the flowers open for over a week. 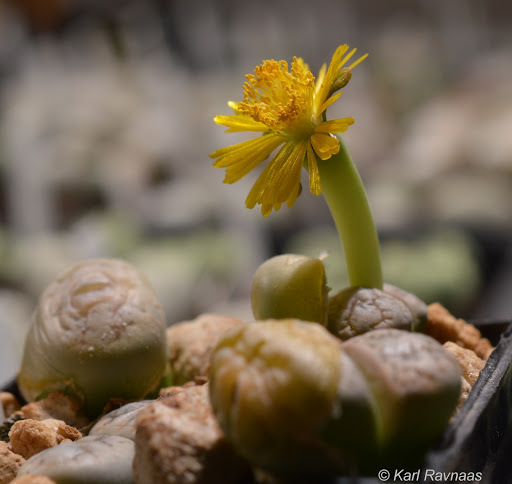 Lithops werneri with a tall flower tube. 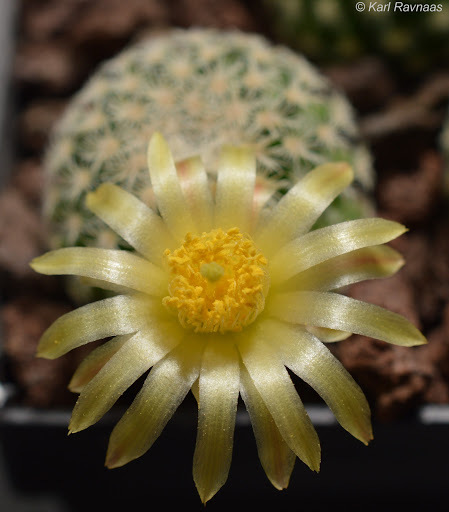 Close-up of the flower of L. werneri, showing a pretty yellow colour. My Turbinicarpus longispinus, much like the Pseudolithos, have simply kept on flowering continuously for a year now (also see previous post on this species). I am surprised that they aren’t taking a break. I suppose my conditions with the artificial light and regular watering might simply be confusing them into believing that they’re in a never ending flowering season. 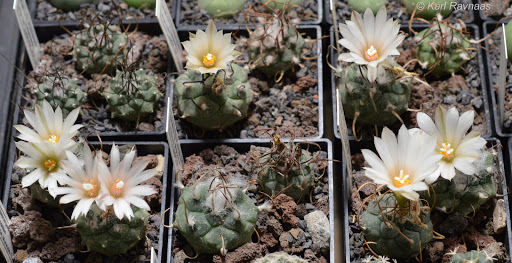 It is also a bit surprising that this species is so ready to flower, while other Turbinicarpus species I have that are just as old and by their physical appearance should be ready to flower, have not yet done so. I expect the reason must simply be that some species of the genus require a (probably cooler) resting period while others don’t need this in order to flower. 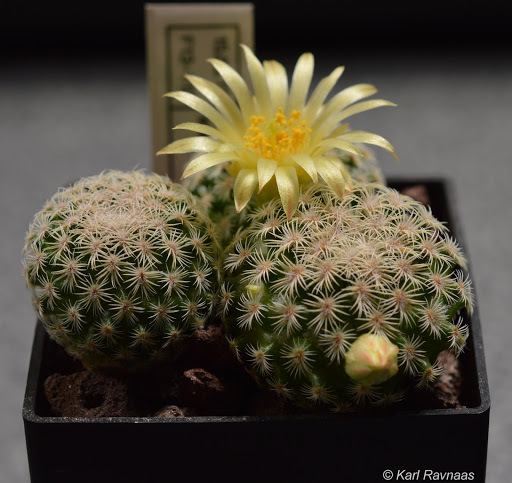 The last pictures in this update are of two new Mammillaria species flowering for the first time. 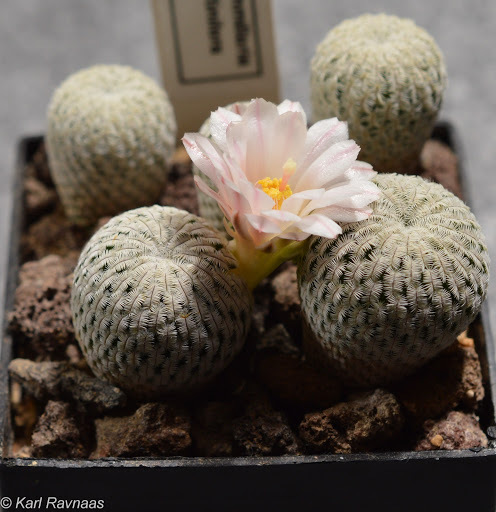 Some decades ago these two species were thought to belong to a different genus than Mammillaria and the genus Solisia was erected for the two of them. I’m not really sure exactly why this was done and especially not why these two species were thought to deserve their own genus. 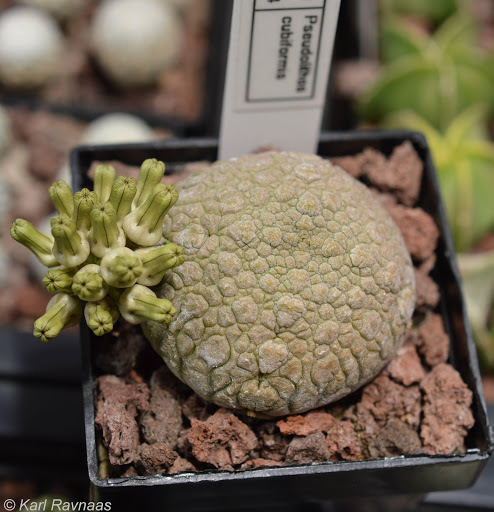 Apart from some physical similarities (particularly spination) I don’t really see a close resemblance between them, and the genus Solisia was abandoned a long time ago. 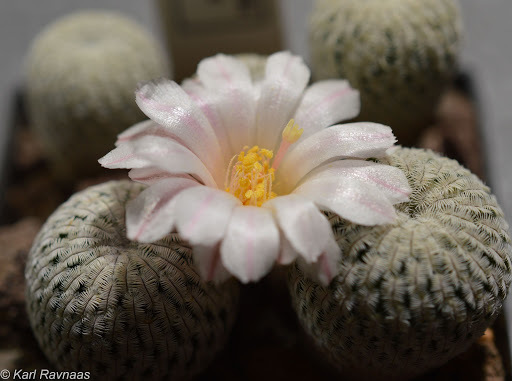 Mammillaria solisioides showing both flower and buds. The flower is approximately 3 cm wide. Close-up of the flower of M. solisioides. The heat from the lamps has caused the petals of this flower to bend backwards. 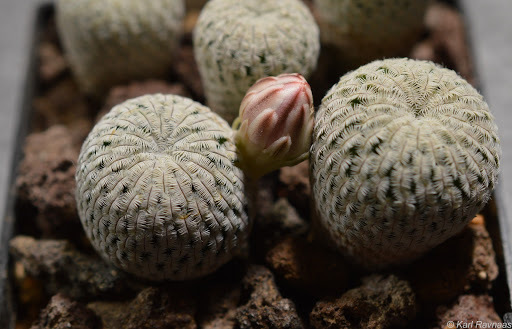 Mammillaria pectinifera with a large bud. So far this is the only plant of this species that has flowered. M. pectinifera with the flower just opened. 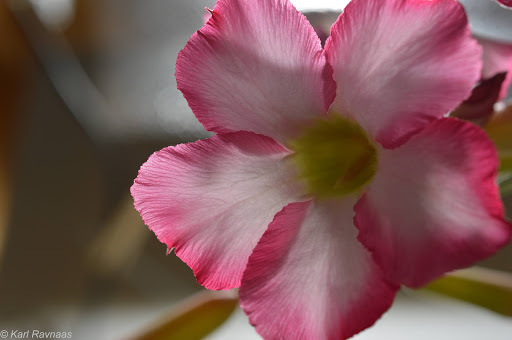 The colour is a very pretty and delicate shade of pinkish-white with a slightly darker mid-stripe on the petals. M. pectinifera with the flower wide open. The flower is approximately 2,5 cm wide. That’s it for this post. Hopefully there’ll be some more flowering in the nursery over the coming months for me to show, but the next post will be about plants in my greenhouse. This entry was posted in Uncategorized by cactusglobe. Bookmark the permalink.